The Albany City Council has talked — off and on for the last year or two — about how to raise funds to fix the city’s streets and keep them in good shape. This will take a mountain of money. But the estimates so far cover only the arterial and collector streets. Residential streets like Fifth and many others are in worse shape and will take additional millions to rebuild. As it turns out, about 17 miles of non-arterial streets that are rated in poor shape lie within the CARA urban renewal district . The district borrows money for projects, then repays the loans from property tax revenue on increased values within the district. This has been a controversial method because until the debt is paid off and the district ceases to exist, CARA takes some of the money that otherwise would go to other public services including schools, fire safety and law enforcement. Behold one of the many potholes on Fifth Avenue S.E.
. For all the millions that Cara had spent if we don’t have decent roads people are going to stay away from that area. The city could at least fill in the pot holes. (1) What are the TIF revenue projections for this $20,000,000 project? (2) How much increased tax revenue will flow back to each of the overlapping taxing districts? (3) Would this project occur without TIF? Hopefully, CARA will show their work in answering these questions to give Albany taxpayers confidence that data, not emotion, drives their decision making.. Many of your streets are a mess. 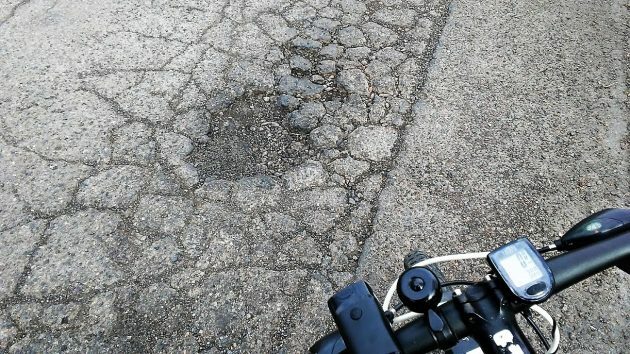 In Hasso’s video it is obvious that the pavement is disintegrating, due to age, weather, poor/no maintenance, improper installations, etc. I also question how much of the bumpiness is caused by the utility companies and their contractors (water/sewer, gas, electric, telephone, etc.)? Presumably by city permit, they are allowed to trench thought the pavement to install underground infrastructure and then required to return the pavement to a “as found” or better condition. How may of us have driven/biked down the a street months after such work has bee completed and found canyons where their repair work has subsided below the level of the original pavement, thus causing a jarring ride? This seems especially noticeable in newer areas where there is frequent disturbance of the pavement. In some cases the repairs seem to work, in others not. Are there any established procedures on the permitting agencies part to ensure the repairs hold up, i.e. require a bond from the installing contractor for any repairs and perform an inspection say six months later. Even now I can hear a chorus from the city leaders “We have no money or time to do this. It won’t work.” Sounds like a good opportunity for a citizen advisory committee! Street Repairs! Yes! Hooray for keeping up the commons. We should be that is. Like the video HH. At one minute and twenty two seconds, you let out an audible Ahhhhh. Just wish we could have viewed a nice close up of that particular pot-hole. That is what it was ….right? Anyways, I enjoy your postings. Personally, I believe that “poor” (needing complete reconstruction vs. an overlay) streets are a strong contributing factor in blight. As such, I believe some CARA money could very wisely be used to fix the worst-of-the-worst. Especially if the work could be combined with existing future plans for water, sewer, stormwater reconstruction. Whether or not is should be 100% of the balance of borrowing authority in CARA has to weigh against competing projects in the current & future plans. That said, I have no problem getting behind using some for street repair in the URD because it will not require raising additional fees, taxes, G.O. bonds, etc. to do so. It will also allow the existing general fund $$ plans, to work on underlying infrastructure, be better utilized in other areas of the community for similar purposes — that also need serious repair. Those streets east of Lyons are a lot worse than the sidewalks and trees they just repaired/replaced downtown…..
I’m ignorant as to the proper blend for what most of us call blacktop. Been stopped in many construction zones while touring in the RV and saw an interesting paving setup. The machine pulled up the old paving, then pulverized, reconstituted, and relaid it.